Flow cytometric analysis of MOLT-4 cells using Notch1 (D6F11) XP® Rabbit mAb (PE Conjugate) (solid line) compared to concentration-matched Rabbit (DA1E) mAb IgG XP® Isotype Control (PE Conjugate) #5742 (dashed line). 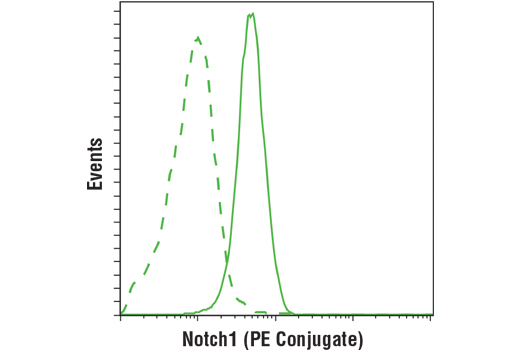 Notch1 (D6F11) XP® Rabbit mAb (PE Conjugate) recognizes intracellular epitopes between 2400 and 2500 amino acids of human Notch1 protein. It recognizes both the full-length (~300 KDa) and the NTM region (~120 KDa), which consists of a short extracellular juxtamembrane peptide, a transmembrane sequence, and the intracellular domain (NICD). The antibody cannot detect the extracellular (ligand-binding) domain of Notch1 following cleavage at the S2 site by ADAM-type metalloproteases. Monoclonal antibody is produced by immunizing animals with a synthetic peptide corresponding to residues surrounding Gln2487 of human Notch1 protein. This Cell Signaling Technology antibody is conjugated to phycoerythrin (PE) and tested in-house for direct flow cytometry analysis in human cells. The antibody is expected to exhibit the same species cross-reactivity as the unconjugated Notch1 (D6F11) XP® Rabbit mAb #4380. Notch proteins (Notch1-4) are a family of transmembrane receptors that play important roles in development and the determination of cell fate (1). Mature Notch receptors are processed and assembled as heterodimeric proteins, with each dimer comprised of a large extracellular ligand-binding domain, a single-pass transmembrane domain, and a smaller cytoplasmic subunit (Notch intracellular domain, NICD) (2). Binding of Notch receptors to ligands of the Delta-Serrate-Lag2 (DSL) family triggers heterodimer dissociation, exposing the receptors to proteolytic cleavages; these result in release of the NICD, which translocates to the nucleus and activates transcription of downstream target genes (3,4).